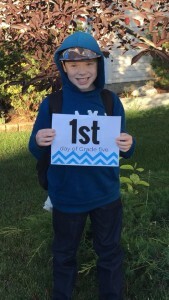 Back -to-school is always a fun time around our house especially the first day of school. My kids go back-to- school in just over a month and even though I am excited,I’m totally bummed at the same time. I don’t want summer to end…. ( most of the time anyways). The kids are all very excited, especially to see their friends and finally get a chance to open the box of school supplies and wear all those new clothes we have stashed away for those first few days back at school. And as a special gift to my readers, I have created a set of free Back-to-School printable. The set includes grades up to 6th, including preschool, pre-k and kindergarten. 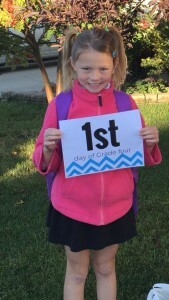 All you have to do is click the link below and print out the year that you need and snap a picture of your little one on their first day of school. If you have a child at a school whose language is other than english, email me and I will create a set for the language of your choice. The youngest doesn’t start until Friday so I will snag one of her too when we get it! Love the ideas, will be sharing it with friends! I wish my son was younger! Adorable printables! We are getting ready to start school so these will come in handy! These are great. Awesome printables. I am human kidless but back to school is coming soon. This is a good way to ease into it and be prepared. I can’t believe it’s almost that time again? Seriously…where did the summer go? These are so cute! I miss those first days when my kids were all excited to use their new school supplies. Wow, I can’t believe it’s that time again. I’m so not ready this year. So not ready. look how cute! Thanks so much – we will use these! I love the simple chevron pattern of your printables! They are very cute and we might just use them! The first day of school is on 9/2 for us! These are great printables. It sure seems like the summer has flown by. Those are really cute! I love the Chevron pattern you used. I so need to print these off and have my kids old their grade and take a photo. So cute! I will for sure be sending printables in my kiddos lunches. They were homeschooled the last year so wanting to go back in September – I will miss them and need to send little letters! Thanks for offering such great printables! I can’t believe it is almost time for the kids to go back to school again. 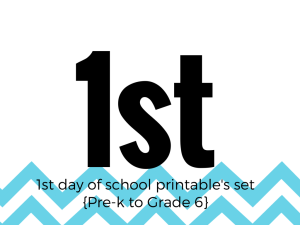 I am so not ready for the school year start, especially since my younger son will be a senior in high school, but I bet these printables will be super helpful for everyone with younger kiddos! Perfect timing for these. They are adorable. Wow, Summer flew by… I can’t believe it is August in just a few days! I can’t believe school is due back already. Where did the summer go. This is such a cool idea and will make a great memento . The first day of school is always fun.